Wrap your guests around your little finger with fiery fiesta style food that’s perfect for parties, picnics or during the game. Mix together the ground turmeric and Nando’s PERi-PERi sauce and coat the chicken fillets in the mixture. Heat oil over a medium heat and brown the chicken until cooked. To make the salad, mix the watermelon, tomato and mint and dress with the freshly squeezed lemon juice and extra virgin olive oil. Mix together the yogurt and toasted cumin seeds and set aside. Toast the tortillas over a gas flame or in a dry pan over a high heat. 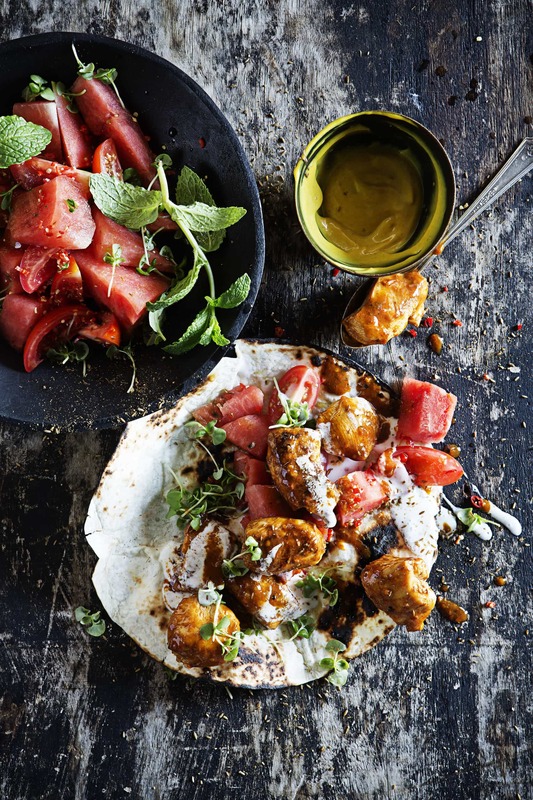 To assemble, place the toasted tortillas on a plate and top with the watermelon salad and chicken and spoon over the cumin yogurt. Garnish with micro herbs and serve. Next articleWhat Is A Modern Day SNAG?